SkyDemon flight-planning services are available on multiple platforms. They help you plan a journey, brief yourself on potential hazards both permanent and temporary, calculate performance, prepare for flight and later analyse your track logs. 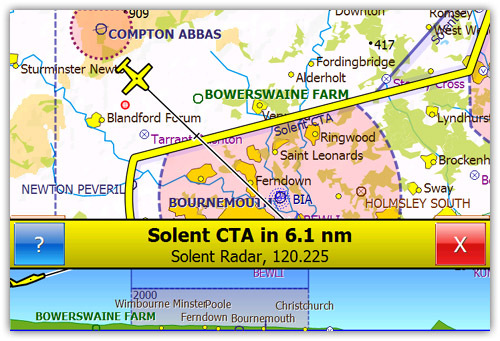 Internet connectivity is required for live briefing data to be delivered, including NOTAM, airfield plates, TAF, METAR and other forecast data. The easiest way to discover more about SkyDemon is to try it yourself; we offer free 30 day trials of our service which you can access using any of our supported platforms. You'll save countless hours of planning time during the trial alone. This page gives you a taster of some of our major features, and how they can help you. Our charts are widely recognised as being the clearest available for aeronautical use. Comprised of official data organised cleverly into visible and hidden elements, they show you only what you need to see and nothing else. Details such as the vertical boundaries and activity periods of airspace, contact frequencies, runways and much more are easily accessible yet not intrusive. Moving from national printed charts to SkyDemon's own, you'll be amazed at the difference. And because our charts use vector graphics, they can be rotated while in flight so your track points upwards with no loss of legibility: all text stays the right way up. If you're already comfortable with a particular style of chart, no problem. We support six different chart styles: two of our own, and four designed to use similar colours and line styles to various national printed charts. Plus, unlike our competitors, we don't charge extra for charts. If you decide to fly to another country, simply turn on the new chart and start exploring. Planning a route with SkyDemon is as simple as clicking on, or touching, consecutive waypoints on the map. This intuitive method of route planning is one of the hallmarks of our software's simplicity of use. Once configured, the route can easily be adjusted by dragging legs to create diversions. 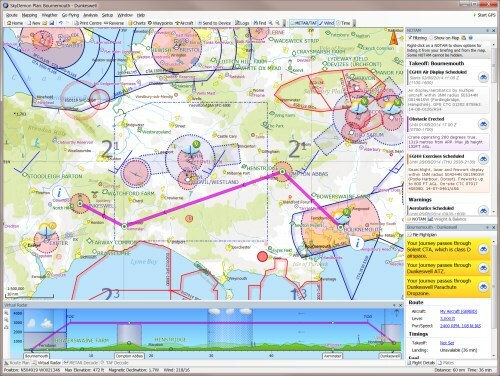 Invented by SkyDemon, Virtual Radar changed the way pilots visualise their route and is now an essential addition to the main chart when planning a journey. It shows a side-on view of your route with respect to terrain, airspace, obstacles and other features of interest that are likely to affect the flight. 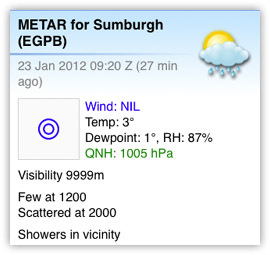 At a glance you can tell what adverse (or beneficial) weather conditions are likely to affect you, based on live data. This unique presentation of your route also allows you to intuitively change the planned level of any leg, and insert waypoints to plan vertical diversions around airspace. 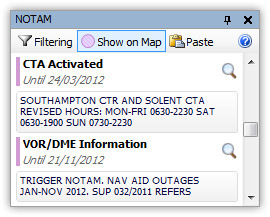 NOTAM information is integrated throughout SkyDemon. As you plan a route you'll see the very latest NOTAM in force downloaded and depicted on the main chart, in the virtual radar and in a dedicated NOTAM briefing section. Our technology makes it possible to visualise most NOTAM graphically, leading to enhanced awareness of the temporary hazards that could affect your flight. We even colour-code them so you can distinguish at a glance between the most common types of hazard. Your NOTAM briefing is updated in real time as you plan, and can show you a narrow-route briefing based on your route corridor or an area briefing if you plan simply to fly within your local area. You're in control of the time period, flight rules and other filters applied. These forecasts and observations are key to understanding how enroute conditions at any particular time could affect your flight, and both are downloaded and displayed in real time as you plan a flight with SkyDemon. Much like our NOTAM integration, TAF and METAR are represented on the main chart, in the virtual radar (where you can even see the cloud layers and weather) and in their own dedicated window, where they can be decoded graphically or viewed in their raw form. You don't have to keep re-checking for new bulletins, either: just leave SkyDemon running with your route loaded, and you'll see new TAF and METAR appear as they are published. Our sophisticated document management system monitors your route as you are planning and lists all plates available for airfields enroute. It is easy to select and view a plate, which is then cached for subsequent offline retrieval. We supply documents from the national Aeronautical Information Publications of most countries in Europe (both VFR and IFR) as a standard part of all SkyDemon subscriptions. In addition there are lots of national and private organisations who publish their own plates for airfields, and many of these have chosen to make these plates available for easy delivery through SkyDemon for an extra charge on top of your normal subscription. SkyDemon knows what the wind is forecast to be doing anywhere on the globe, at all common VFR altitudes and up to 24 hours ahead. It uses this knowledge to help you calculate the parameters for your flight, automatically taking account of what the wind is doing through every stage of your planned flight in order to give you the right headings to fly and the most accurate estimation of your fuel consumption. You will see the wind represented by symbols on the main chart at regular intervals, which can be inspected to see just what the conditions are. As you change the planned time and level of your flight you can see these update in real time. In the virtual radar you can see head- or tail-wind components and easily recognise if it would be beneficial to change your planned level. Along with the clear presentation of your route over the main chart and in the virtual radar, we also show separate planning warnings which explicitly call out each hazard. Updated in real time, it's easy to change your route so that the hazards are no longer a problem. Planning warnings are shown for penetration of all sorts of different airspace, proximity to ground-based obstructions and other situations. In many cases, planning warnings are interactive: they can be clicked or touched to scroll the main map and reveal the hazard, or to automatically alter your route to avoid it. The Pilot Log contains all your waypoints, legs, statistics and calculated data to help you fly an accurate course. This includes headings, groundspeeds and a minimum safe altitude for each leg based on configurable safety margins. Designed to be taken along while in flight, the plog contains all the information necessary to navigate a flight by dead reckoning (in combination with a printed chart) which is a great backup even if you're using a GPS to fly with. In addition to these traditional contents, SkyDemon automatically adds frequencies for ATS units you're likely to need to speak to, and for radio navigation aids you may wish to use. You can also turn on extra output such as RNav vectors for waypoints. When you create a profile for your aircraft in SkyDemon, you specify how much fuel it uses in all flight configurations. This allows us to produce a very accurate estimation of the minimum fuel required for a trip, including standard reserves and contingencies. Even the forecast winds aloft are taken account of, which of course affect your timings and how much fuel you use in all stages of the flight. You can also specify how much fuel costs to purchase locally, and how much your aircraft costs to run or hire. This enables SkyDemon to keep you updated with the likely actual cost of your flight as you create it. Part of the aircraft profile you'll create when you start using SkyDemon defines the various loading points and their distance from the centre of gravity datum. 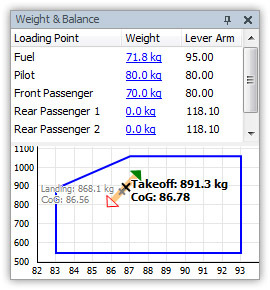 When you're ready to fly you can therefore enter the weights of passengers and luggage, and the software will automatically fill in the weight of the fuel you have elected to carry (assuming only one fuel tank). You can then see at a glance whether your planned configuration falls outside of the acceptable loading envelope. Because SkyDemon already knows about your route and your aircraft, it can produce an ICAO flightplan with almost every field filled in automatically. We have partnered with EuroFPL to deliver instant filing of VFR flightplans, integrated within our software. 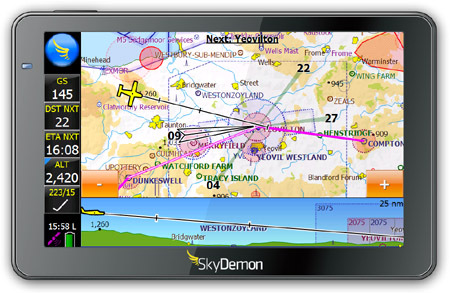 Using a modern, internet-connected mobile device, you can file your flightplan from SkyDemon as you sit in your cockpit ready for takeoff. Your plan is instantly delivered to all air traffic units concerned with your flight, and there is no need to fax or even type anything. 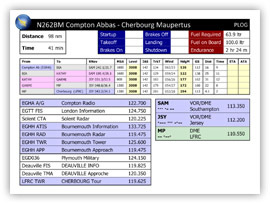 There is a per-flightplan charge of £0.50 associated with filing flightplans. 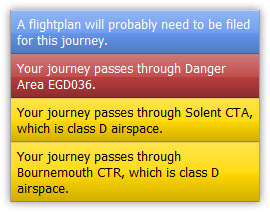 After your flight, you can view a log of your journey from your SkyDemon flight-planning software. We support logs produced by our own software and devices of course, and the import of logs in industry-standard GPX format. Additionally, we support direct interfacing with many Garmin and SkyMap aviation GPS units for direct log retrieval. Once loaded, you can not only view the horizontal route you took on the main chart, but the complete trajectory in a dedicated virtual radar window that precisely shows which features you passed over or near, and which airspace you penetrated. Using SkyDemon in the air to help you navigate and stay safe will make your life easier, and free up more time to actually enjoy your flight. Its features are designed to lessen your workload, protect you against hazards and give you the briefing information you want when you need it. Just like our flight-planning features, SkyDemon's navigation features are available on multiple platforms . The clarity of SkyDemon charts is unmatched, no matter which chart style you have selected. This is perhaps most important while you are actually flying, and do not want to be distracted by details that are not relevant. Our charts can adapt themselves as you fly, dynamically hiding airspace thousands of feet above where you are for a clearer view. 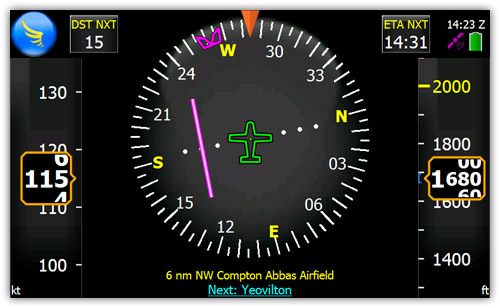 Choose north up, track up or course up orientation and rest assured that the chart will remain crisp and readable. You'll notice that it's not only mapping data that appears on your SkyDemon chart when flying: as your approach your destination, extended runway centrelines spring out, and pieces of airspace light up and you approach and enter them. SkyDemon will guide you through your route, from one waypoint to the next, giving you clear instrument readouts that keep you aware of your progress, the outside conditions and how far left you have to run. A direction indicator shows you current track (true or magnetic) with a bug that is automatically updated to point to your next waypoint. Depending on which product you are using, a position report is either displayed permanently onscreen or is accessible by simply touching the aircraft icon. As you approach your destination you will see extended runway centrelines spring out from the airfield on the chart. These help you align early and form a quick appreciation of your position relative to your destination runway. The rest of the features on this page all expand on how SkyDemon helps you once airborne. Once in flight, the pilot log transforms to highlight each leg as you fly it, with visual cues clearly showing your progress. An extra column appears showing your ETA or ATA at all waypoints forming your journey. In planning mode, the pilot log suggests all the frequencies you are likely to want to use during your whole flight. When actually in flight, you can see at a glance every ATS unit that you can speak to from your current position. Switching between the map and pilot log is easy. We offer a Direct To function, which quickly lists all nearby airfields with their longest runway lengths, and at the touch of a button you can instantly plot a route directly to the destination of your choice. Arguably the most significant instrument in SkyDemon, virtual radar switches into live mode once you are in navigation mode. It shows a realtime projection on your trajectory ahead relative to terrain, airspace, NOTAM, ground-based obstacles and other features. Your vertical speed is clearly represented, making it easy to see where your climb or descent will take you over time. As you fly, SkyDemon sends out virtual radar pings into its charting data to generate warnings when approaching any hazard. Here are some of the warnings we use to help keep you safe. When approaching airspace, a colour-coded warning is displayed and you are shown a callsign and frequency (where available) to gain penetration. These warnings are configurable and can include danger, prohibited, restricted, controlled, sporting, MATZ and ATZ areas. When approaching a fixed ground-based obstacle a warning is displayed with an advisory level to climb to for avoidance. When approaching an area covered by a NOTAM a warning is displayed allowing you to view the details associated with the notice. When approaching terrain, a warning is displayed and your path relative to the terrain is clearly visible in the virtual radar. Whether you wish to simply glance at your current groundspeed for interest or you want to navigate your entire route with the onscreen HSI, SkyDemon has it covered. The altimeter can show either altitude above local mean sea level or your height above the highest nearby terrain. The distance and time readouts brief you for your next waypoint, your destination or for the approaching runway threshold. Once aligned with your target runway you can switch to instruments view to use the pseudo-ILS. This offers horizontal corrections to keep you on the extended centreline and optionally vertical corrections, based on GPS altitude and a user-definable glideslope, down to 500ft AGL. This is great as a training aid for IMC flight, and for conditions where visibility is impaired. When you are nearing your destination airfield, you want as much information about your approach at your fingertips as possible. We created the approach information screen to instantly provide you with runway layout, elevation, frequencies, local weather and any applicable NOTAM. You can even touch a runway end to nominate it, at which point both circuits will be roughly depicted overlaid onto the runway map so that you can quickly form a mental picture of how you will join the circuit and land.